Vocal King Narayan Gopal Guruvacharya was born on Wednesday Ashoj 18, 1996 Bikram Sambat (BS) to a Newar family in Kathmandu. He was the sixth child and second son of renowned Sitar player Late Asha Gopal Guruvacharya and Ram Devi Guruvacharya. Narayan Gopal's father being a classical musician, wanted his son to venture in music field and follow his footsteps. To the satisfaction of his father, Narayan Gopal became interested in music from his early years. But, the interest turned out to be not exactly into classical field. He went to India to study classical music. But, he was more interested in singing than a classical music. Music composer, late Gopal Yonjon and Narayan Gopal were very good friends. To make the friendship last longer they were bonded together by being "mits" - an unique Nepali custom where good friends enter into a kind of a lasting friendship. Being mit is generally seen as strengthening of the friendship bond between two friends. 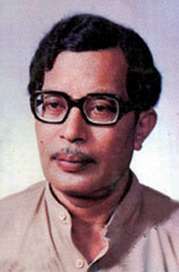 Narayan Gopal has sung many beautiful and soulful songs composed by Gopal Yonjon. Narayan Gopal married his long time fan from Darjeeling, Pemala Lama. Pemala and Narayan Gopal didn't have any children.